Once again, lucerne crown borer (LCB) (Zygrita diva) has been active in soybeans this season. Worst affected regions were the Northern Rivers and the Liverpool Plains in NSW, but reports were also fielded from the Bundaberg, Fassifern and Darling Downs regions in Queensland. 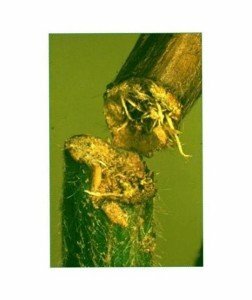 In some of the severely affected crops, over 80% of plants were infested, and up to 70% girdled. Girdling to soybean stem caused by lucerne crown borer (Joe Wessels, DAF). Note how the stem has browned off and died above the girdle. Girdling occurs when stem-boring larvae nearing pupation ringbark the plant’s stem internally, severing the vascular tissue. They then use this tissue to plug the stem’s pith canal, thus creating a secure overwintering chamber in the tap root. While larval infestation itself (tunnelling in the pith) is unlikely to cause major yield losses, girdling is another matter. If girdling occurs before pods are filled, there are obvious yield losses. But losses can still occur when pods are fully filled, as girdled stems are weakened and frequently lodge, falling onto the ground where they are out of reach of harvesters. Side branches can also lodge when their bases are weakened by larvae tunnelling down to reach the main stem. In general, infestation levels are higher and girdling and lodging more likely in earlier (early November) than later (late December) planted crops. Girdling is also more likely when crops are drought stressed. 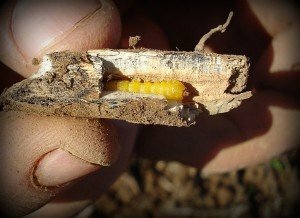 This is because decreasing stem moisture effectively mimics the pre-harvest dry down stage, and larvae react accordingly by preparing for overwintering and pupation. 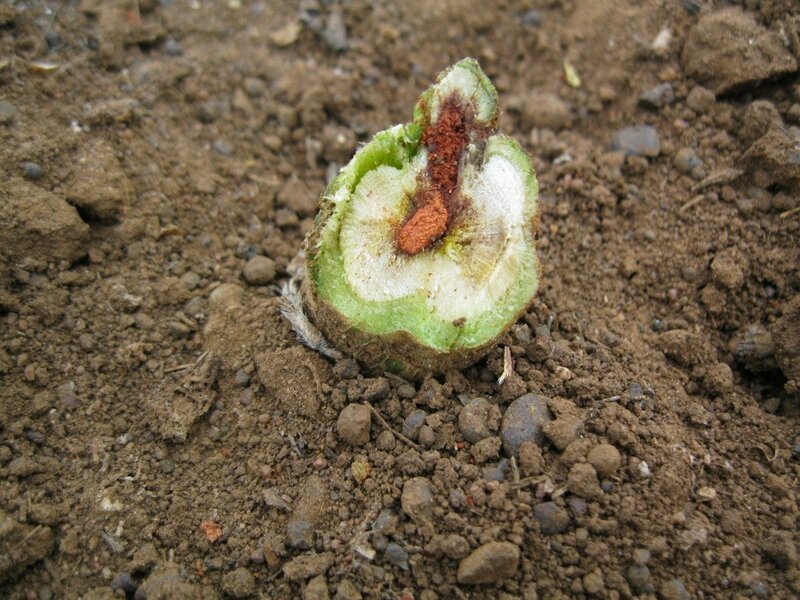 Pesticide control is difficult because larvae feed inside the stem’s pith and cannot be reached by insecticide sprays, even ones with systemic activity. Spraying the adults is also problematic as crops are invaded over an extended period of time, and multiple sprays would be required to give effective control. As well, even very low adult populations can give rise significant larvae infestation levels. A Kingaroy trial with less than 0.2 LCB adults per square metre had 45% of plants infested and 30% of plants girdled at harvest. Multiple sprays would also greatly increase the risk of flaring whitefly, mites and helicoverpa. While seed treatments have potential as a LCB management option, they are not currently registered and residue trials are required to determine if the active ingredients are still present in the seeds at harvest, or in plant tops where crop stubble is grazed. Additionally, only products that have no detrimental impact on soybean nodulation would be suitable. Delaying planting reduces the chances of LCB girdling plants before pods are filled, however consult with your local agronomist as potential yields are sometimes greater for earlier plantings and this must be balanced against the risk of greater LCB damage. Avoiding moisture stress is important as this can trigger premature girdling, which has been observed as early as February in recent hot summers. Although not an option in dryland crops, targeting an irrigation before the crop becomes stressed is an effective prevention strategy. 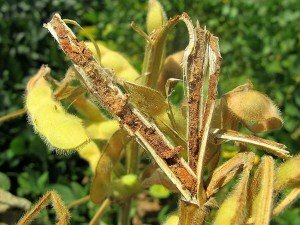 Controlling volunteer soybeans and weed hosts such as budda pea, sesbania and phasey bean is important to minimise the presence of alternate sources of LCB. Using cultivation to bury and/or split the soybean stubble attacks the pest when it is most vulnerable, i.e. when overwintering in your paddocks. Strategic tillage assisted by GPS steering allows tillage to be confined to narrow strips along the old plant rows. It is no coincidence that LCB activity is greatest in zero till paddocks. The burying of the stubble to >10 cm also helps to suppress soil borne diseases such as phomopsis and charcoal rot, which are favoured by zero till. Breaking the life cycle by preventing pupae from successfully overwintering is an essential step toward minimising the occurrence of this pest. This work is forms part of the Northern IPM Project (DAQ00196), funded by GRDC. Update on Russian wheat aphid outbreak in South Australia. Are there Russian wheat aphid in your wheat or barley? A short guide to checking and identifying. For suspected sightings of Russian wheat aphid or Megoura, ring Biose­cu­rity Queens­land on 13 25 23. GRDC have released a new video about the changes to 2,4-D label requirements. Find biosecurity resources at the Grains Farm Biosecurity Program run by Plant Health Australia. There's even a new free biosecurity app available! Want to know what's on the horizon? Watch BOM's latest climate outlook video or learn more about climate at the Climate Kelpies website. Sign up for email noti­fi­ca­tion of new posts. Sign up for email notification of new posts.